Let the prequels begin ;-) My garden saw foliage chosen over flowers, straight lines over curves, shrubs over perennials and little attention to birds, birds, bees, butterflies or hedgehogs. The image above, taken Chelsea Flower Show 1996, brought the black grass (Ophiopogon planiscapus 'Nigrescens'), heuchera, slate blue pebbles (collected up and moved around many times!) and heuchera into my garden. It also influenced me to under plant foliage in drifts and I have lifted and divided the heucheras many times. I’d say this was the key inspiration image to my present garden and I have many images collected! Once again, pre blog I never paid much attention to the tiny flowers of the heuchera and that bees would feed from them. I have since discovered that the added bonus is that mass drift planting benefits the bees too as it becomes like a feeding station for them and is a great idea. Bees need our help with their declining numbers. 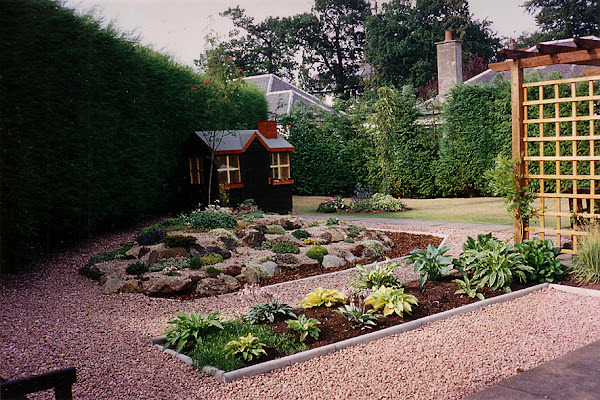 Alpines, pre having my own garden, were my first plant group love and a serious renovation was required to the rockery we inherited which I made into a scree with a path into it (not seen from this old scanned photo) for my daughters to walk up and sit on the big key stones. Now… I always looked for flowers in the alpine world – especially the tiny delicate ones. 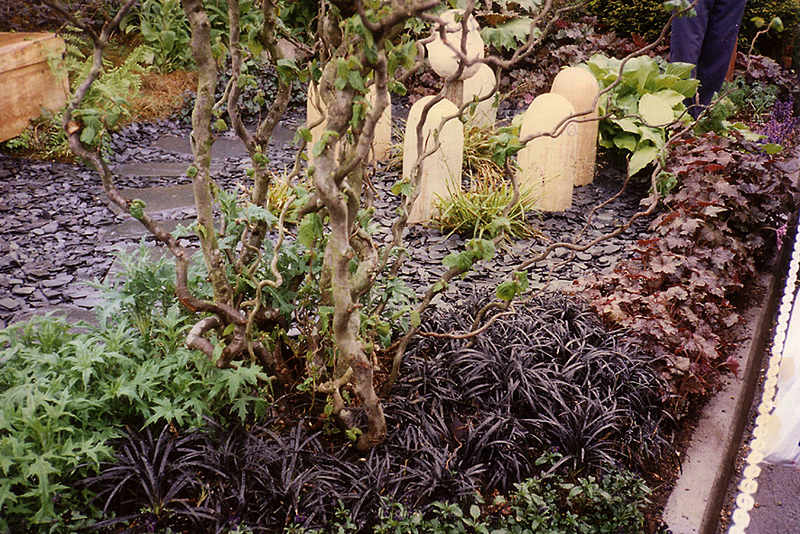 I loved this original hosta bed view but, to my annoyance at the time, so did the birds. I believe Blackbirds were the main culprits that scattered the earth over the edges on to the gravel. I wasn’t a fan of the birds then. 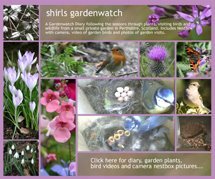 Pre blog, I had only been feeding the birds a short time but way back 18 years ago just by covering the ground with plants, not considered by me at the time, I was helping provide food for the birds – insects and slugs. Yep... and I was only thinking of cutting down on the weeding! You can see, above, the original chequered washing drying area I inherited above and you can take a guess at the work, compost and soil improver required to grow plants here. This area is quite different again as seen in this blog already. My reason for including this image is to show that I have learnt that an open garden area like this doesn’t attract birds and wildlife and that’s what I say to people when they say they don’t see birds coming to a bird table. Often there is no shelter. The pergola view shows a focus for the garden as a whole but it was also constructed as shelter from the sun for us and we kept a table there for a while. A number of plants have grown up the trellis and poles but after winter losses it is now covered with ivy and wisteria. 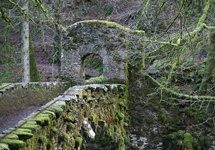 My reason for showing this is that pergolas and arches also provide shelter for the birds– food too with the many insects including spiders that live there. Pre blog, I never considered this either and now I deliberately create areas like this. I am trying not ramble on here, but the message I want to share is that Pre blog I was a gardener enjoying plants and never saw myself as a wildlife gardener. However, I can see now that even by ‘controlling’ my borders and not letting them grow wild I was still providing homes and food for wildlife. I was building up a simple eco system that was growing in species. 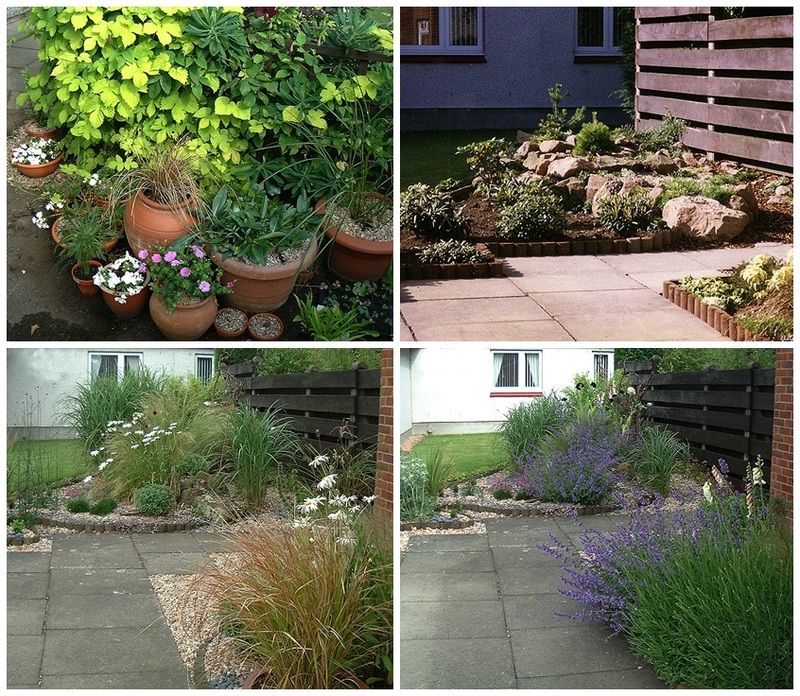 The bottom two images above show the most dramatic change my garden has seen from straight lines (gravel mulch) to curves, no gravel mulch and plants with height. It really is easy to see now, as my daughters were playing on their swing (on the right) there just had to be birds watching, waiting for them to go indoors so they could resume foraging for food. I still have a love for woodland flowers but now I’m looking at different varieties and adding wildflowers to my border plantings – all for the sake of bees and butterflies. Pre blog, I never noticed if butterflies were around and if they were I had no idea what they were – now I do and if I see a new one I am delighted! Recent wet summers haven’t helped their numbers either. My sunny open front garden (that edges car parking space) originally had some shade from a mature cherry tree that we had to regularly prune. I began a collection of hybrid yak rhododendrons and a mulch of cocoa shells was fantastic for colour and smell and a great weed suppressor at the time. Unfortunately the birds made the biggest mess ever digging into the edges. I really wasn’t a fan of the birds back then!! What a trip down memory lane this has been I and quite a challenge in selecting just a few images from so many. For those gardeners that see me as a birds person you can see now that I haven’t been really. However, once we put bird feeders up for my daughter’s school project and we saw how many different ones there were to be seen, it became just the same as a new species of plant to me. 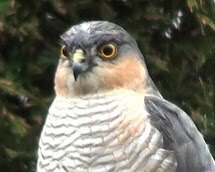 I took photos and read up about them and looked out to see more species. My garden borders got little tweaks here and there to accommodate feeders and so it went. Pre blog I could never have imagined that this gardener would have pruned one of her precious low domed palmatum dissectum Acer trees so a cat couldn’t sit underneath it to pounce on a bird! I could have imagined even less that, a few years later, I would be tucking a low bird table beneath this same precious Acer tree for the Blackbirds and friends (that had been messing up my border edges) to feed during heavy snowfall. 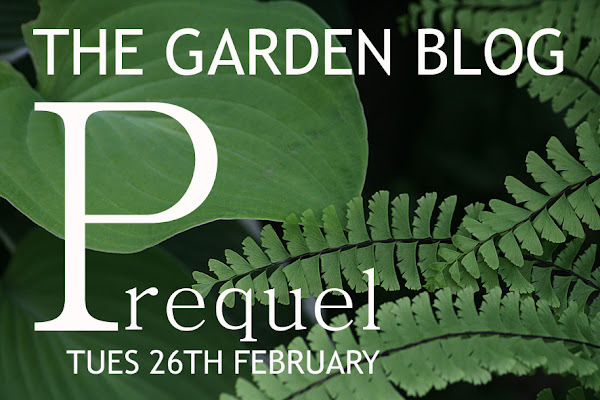 Pre blog I was a very different gardener but now the value I have from my garden is greater than ever and it gets better with every year as I discover new visitors arrive. 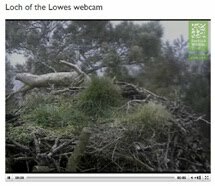 I can’t imagine gardening without considering wildlife and with one special visitor in particular – the hedgehog. Pre blog I had no idea they were even visiting and now I make sure my borders always have a space out for them. Through taking photographs and video for our blogs, I’m sure other bloggers would agree, this closer look has given a new value to having a garden. We have learned so much on the way with the research required when we discover something new – often influenced by reading other blogs and the comment chat that follows. 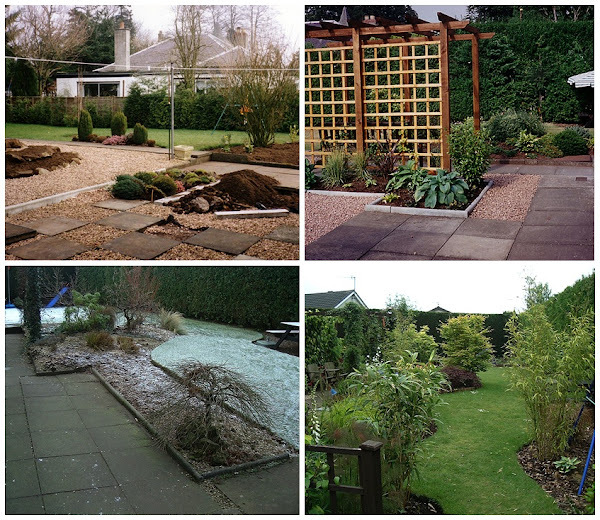 This post was published by Shirley for shirls gardenwatch in February 2013. I enjoyed today's post and learning the logic behind your plot. A garden is always a work in progress. We look after our local birds and they give us much enjoyment except for a pair of big, fat wood pigeons which take the lion's share of the food and make the feeding station sway under their weight. 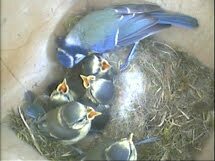 We become more and more resourceful with our hanging of feeders, but so do they! I really enjoyed reading and seeing how your lovely garden has evolved Shirley...super photos too! I've really enjoyed this blog - isn't it funny how all our gardening habits change. I should have joined the blogging world before starting out with my garden - I would have saved myself so much time and effort. Although, where would the fun in that be - I'm sure in a few years, I'll be looking back, just as you have been and know that all the choices I've made were justified. 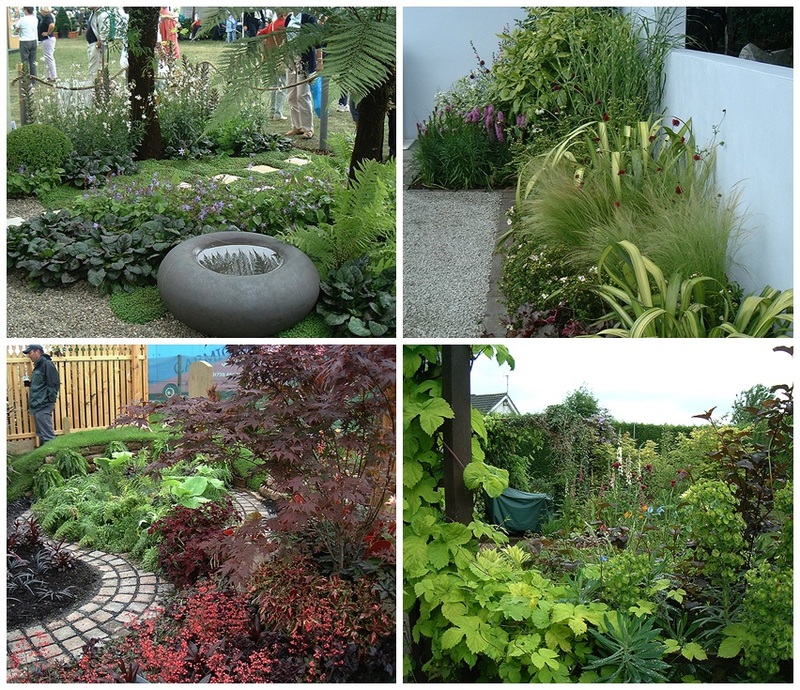 Interesting to read how your gardening philosophy and planting has evolved during your blogging years Shirl. 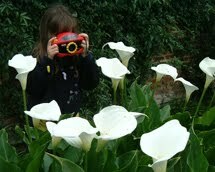 I wonder whether your garden would have followed the same direction without a blog. I wanted to participate in your meme but am unexpectedly away from home at the moment so unable to blog but I am enjoying reading :) Perhaps I will be able to post on this theme when I get home. The journey we gardeners travel in a meandering one isn't it where things loved in the past are discarded as we learn to love new things. I'm always totally amazed by the number of bees browsing the heuchera flowers. 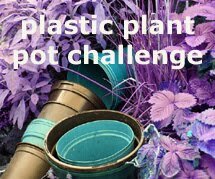 What a fascinating post, I loved following your evolution as a gardener. I started my blog up for the purpose of documenting my garden as I moved into the house. So I don't actually have any prequel as such! 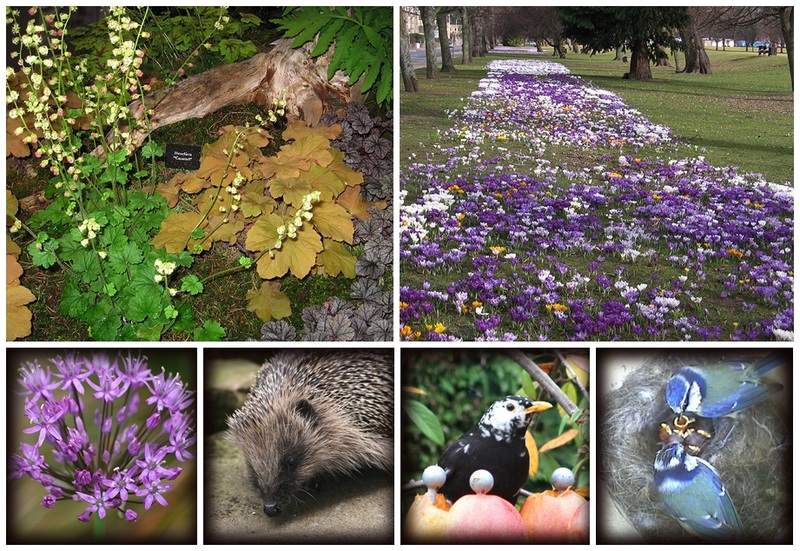 Liz, thanks for sharing your early wildlife stories – I loved hearing them… serious shiver on the snails though. That’s a great reason to start a blog – you prob remember I started as a way to send robin video to my homesick friend in Australia who lost her Scottish parents within 3 months of each other. I only planned to do mine over a few months (enough time to send some snowy images from Scotland). Mm… what happened there? A Yellowhammer in the garden!